The 2019 Mini Calendars are in. 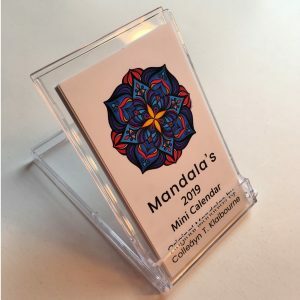 This is my 7th year of creating the Mandala calendar. 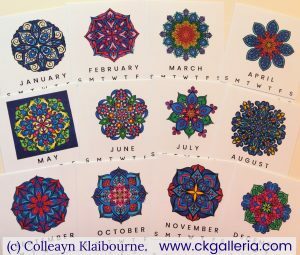 Each month you will find an individual card with a different and new Mandala painting. They are all original works by myself, Colleáyn Klaibourne. The acrylic case flips open to act as miniature stand for the calendar cards. It is available in a clear acrylic case or as a refill without the box. It is great to set beside your computer or end table and takes little room. It is perfect for stocking stuffers, coworker gifts and teacher gifts. When the year is over, you can reuse the case as a card holder. ♥ Mandalas are known to have a calming effect on the mind and body. A Mandala is a symbolic picture or pattern used in meditation. Mandalas come directly from the unconscious mind to heal body, mind and spirit. The design, colors and its geometry are specifically designed to bring about inner focus and inner peace. 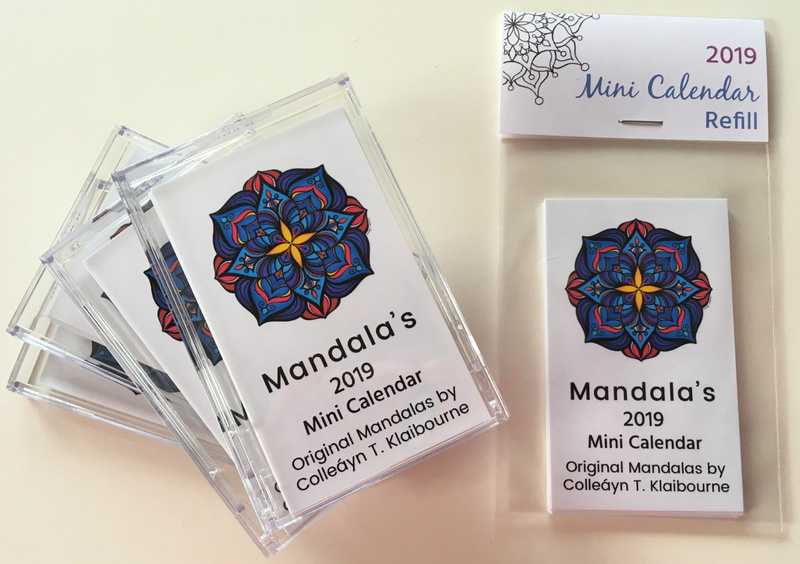 Mandalas most often are in the form of a circle- a shape that represents the self, the Earth, the Sun, and the state of wholeness we strive for. Each design was created by Colleáyn and is drawn free-hand. She goes within the quietness to let the image, colors, and Mandala emerge. 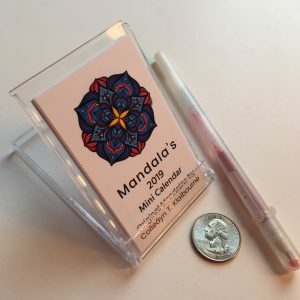 Each time you meditate on a mandala, you will experience new insights & meaning, and it will help you discover more about who you are, in a beautiful way. The mandala will change colors & form, and will create its own healing dance as you gaze in the center of this ancient, healing art. ♦ Colors may appear differently on different monitors.